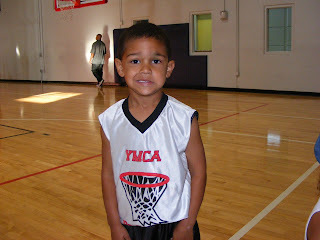 Logan had game 1 of season 2 for YMCA basketball last Saturday. I wish I knew how to put video on my blog...but then again all you would hear is me yelling!! I have a picture of Logan warming up before his game. Interesting tongue action he has got going on...and I have no idea what he is doing with his feet. The other picture is after they got their new uniforms. Yes, that is a black eye he is sporting. Having a boy has definitely been a lot different than having girls! 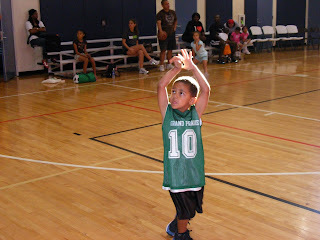 His team lost and that is the first thing he said to me after he walked off the floor..."Mommy, they won and we lost!". He was not happy but I like that he wants to win and doesn't like losing!! I will miss the girls first game which is on Friday but I will make sure to get some pics of them on the blog when I get back.